King Tut's loot takes up an entire wing of the museum. The mask above looks incredible in person. It's crazy to think that they buried King Tut, who was only 19 when he died, with all of this stuff. Ramses II was 97 when he died. 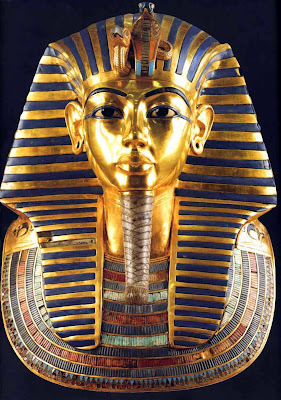 It's too bad his tomb was looted thousands of years ago, I'm sure it would put King Tut to shame! 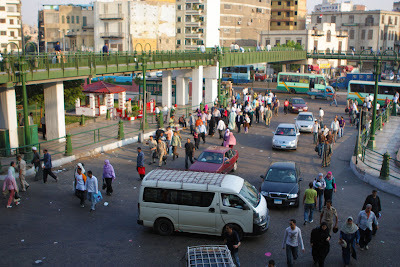 After the museum, we went on a walk through Cairo. 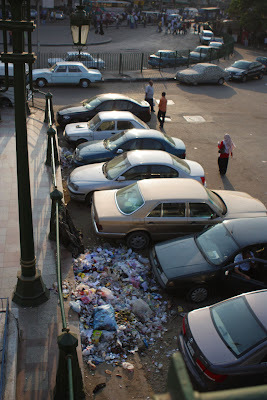 I saw this huge pile of trash that has long since been forgotten and decided to take a picture of it. An instant after I snapped the photo, a guy came up to me and said sternly, "Don't take pictures of rubbage!" We also saw these two women, one with a TV on her head and the other with a bundle of packages on her head. 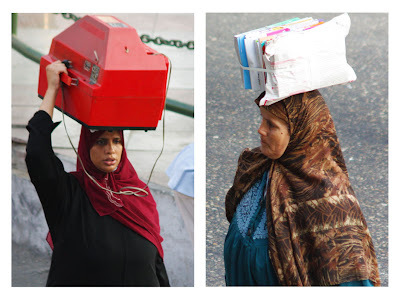 It is very common to see ladies carrying stuff on their heads. You might think it's pretty rare to catch a lady with a TV on her head, but you'd be wrong. We saw it again about a week later. These little mini-buses are public transportation. Most of the time they never come to a complete stop. They will just slow down, the door opens, people get out while others get in, and then off it goes. In this photo, the guys getting off are at a brisk walk. I just thought this was a cool shot. That's all. 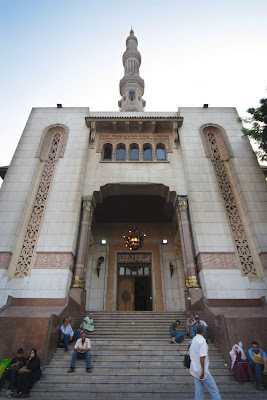 We saw this mosque and thought it would be cool to go check it out and take some pictures. This is the only photo I managed to get because right as the camera came out, we were swarmed by the little kids in the pictures below. They LOVED getting their picture taken and then looked at the screen so they could see themselves. We got the impression that they have never seen a digital camera before. We took about 35 pictures of these boys before we had to leave, they tried desperately to get us to stay and continue taking pictures. 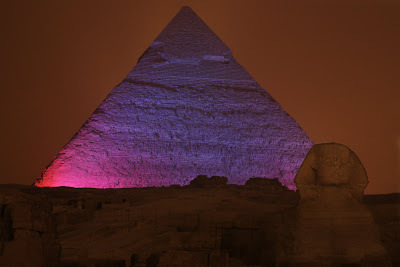 That evening, we went to the sound and light show at the Pyramids. The narration was horribly cheesy, but the light show was impressive! 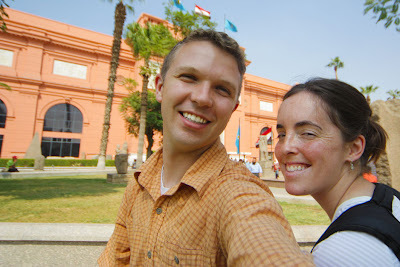 From October 7-21, we went on an amazing trip through Egypt. We traveled through Cairo, took a trip up the Nile, spent a few days on the Red Sea, and went on a day trip to Jordan to visit Petra. It was remarkable to travel through all of these historic areas that were built thousands of years ago. We took 2900 pictures! Over the next several days, we are going to put several posts on the blog (with only a few of these pictures) to show some of the things we saw. Enjoy! 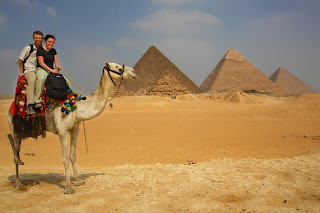 On our first day, we hired a driver that drove us to all of the pyramids around Cairo. He was with us for over 9 hours and drove us for about 100 miles. This personalized service only cost $36. 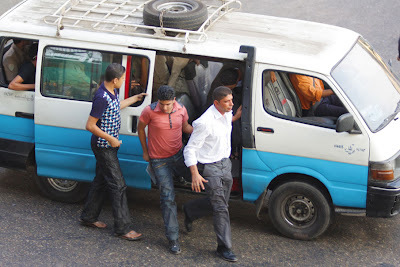 We quickly found that prices in Egypt are much lower than at home. 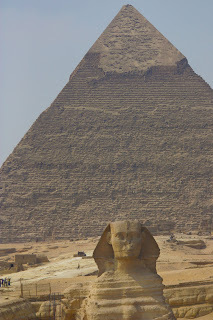 The Great Pyramids of Giza and the Sphinx are amazing! It is difficult to imagine the size of them until you are standing at their feet. We took a camel ride. It was a crazy experience! We both thought we were going to fall off. We went inside the Pyramid of Khafre. It was amazing to walk through this structure that was built over 3000 years ago! The passageways have very low ceilings. While walking through the pyramid, it was fascinating to see how each block fits together perfectly. We couldn't see any gaps and the blocks were perfectly smooth. It was very hot and humid inside the pyramid. It was probably over 100 degrees and close to 100% humidity. 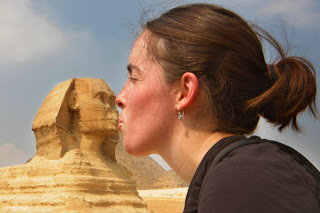 Reini thought the Sphinx was pretty hot! After the Pyramids of Giza, we went to Saqqara and Dahshur to see the Step, Bent, and Red pyramids. These are older than the Giza pyramids. We were able to go inside the Red pyramid. It was only the two of us and the guard inside the pyramid, which was a little creepy. 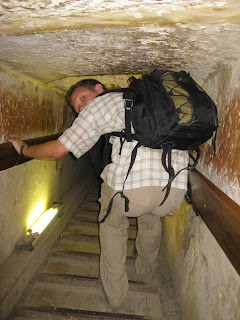 The passage down to the tomb is about 70 feet long and only about 4 feet tall and on a very steep angle. Near the Red Pyramid, we visited a carpet school. In these schools, children come at the age of 8 for a six year apprenticeship on how to make hand tied silk carpets. After the apprenticeship is over, they can either work for the carpet company or they are given a loom and can work from home. A large carpet like the one in the center photo would take one person over 2 years to complete. The cost for this carpet in Egypt is about $13,000. Needless to say, we left only with pictures. 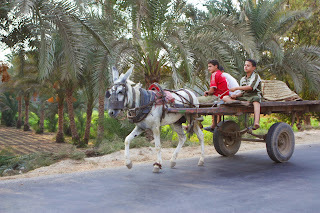 Donkey carts are alive and well in Egypt. It is very common to see them going down the street. 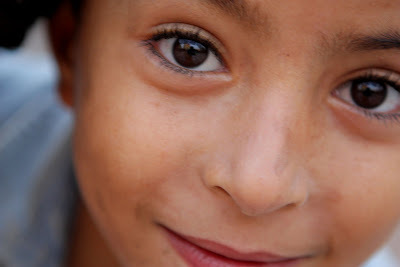 Jared snapped this picture on our way back to Cairo. This was our first Egyptian meal. 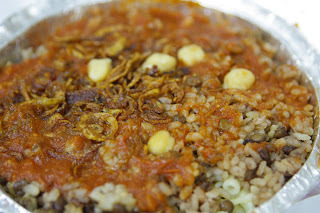 This item is called Koshary. 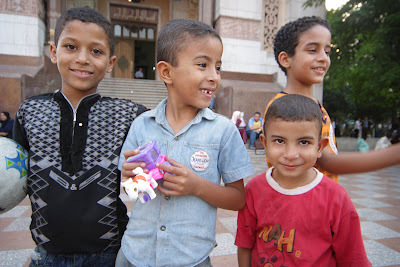 It is a very common food in Egypt. It's not bad, but it's not very good either. We quickly discovered why you never see Egyptian restaurants in America. There is really no market for it. We made a good honest effort to try the local food, but eventually we just gave up and ate western food (which is very popular). 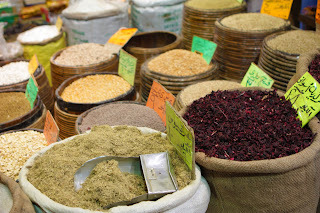 Spice stores are very common in all Egyptian cities. 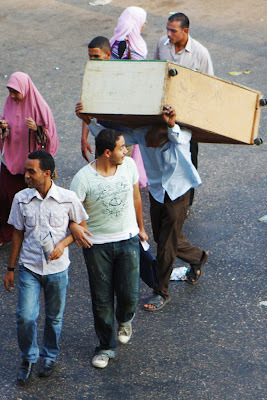 This is one we found in downtown Cairo. They always have big barrels or bags full of various spices. Ever since we moved into our home, we didn't like the wall that acted as a railing next to the stairs. We always wanted to remove the wall and install a real railing. When our friend Jeff Brown told us he could hook us up with the materials for a REALLY good price, we decided it was time to get to work. This is what it looked like before. Jared took the first swing at the wall. Reini took a few swings too. The hammer was takinig too long, so Jared got serious with the Skill saw. However, the dust it created set off the smoke alarm twice and covered the entire house with a thick layer of dust. I highly recommend removing sheet rock with a knife rather than a saw! After the sheet rock was removed, the studs were the next to go. Once the demolition was complete, the building began. The box beam for the newel post was the first thing installed. Then some trim and a skirt was added. Finally, the rest of the trim, the railing, and the base was installed and ready for stain. Reini made a time capsule and put it in the newel post before the cap was installed. After a coat of stain and three coats of polyurethane, the metal balusters were installed. Following two months of hard work, it's finally done! We're thrilled with how it changes the look of our home.